Born of an initiative at the Center for Science and the Imagination at Arizona State University, this remarkable collection unites a diverse group of celebrated authors, prominent scientists, and creative visionaries who contributed works of "techno-optimism" that challenge us to imagine fully, think broadly, and do Big Stuff. Inside this volume you will find a rich blend of science fiction stories, nonfiction essays, and illustrations. 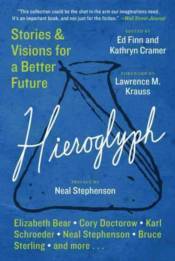 Engaging, mind-bending, provocative, and imaginative, Hieroglyph: Stories and Visions for a Better Future is a manifesto and a blueprint that sounds a clarion call to people everywhere to reclaim our future from grieving over what was and celebrate all that can be achieved. Charlie Jane Anders, Madeline Ashby, Elizabeth Bear, Gregory Benford, David Brin, James L. Cambias, Brenda Cooper, Paul Davies, Cory Doctorow, Kathleen Ann Goonan, Lee Konstantinou, Lawrence M. Krauss, Geoffrey A. Landis, Annalee Newitz, Rudy Rucker, Karl Schroeder, Vandana Singh, Neal Stephenson, & Bruce Sterling.